THREE Cotton Sweatbands for hard hats SOFT COTTON - EASY VELCRO ATTACHMENT - BEST VALUE - WASHABLE AND ESPECIALLY EASY TO ATTACH TO HARD HATS. View More In Head Protection. Three sweatbands for hard hat. Sweatband can easily attach to 1.2-1.7 inches thick suspension of hard hat by attaching velcro strips. Sweatbands are machine washable and can be re-used. Cloth material is 100% cotton. 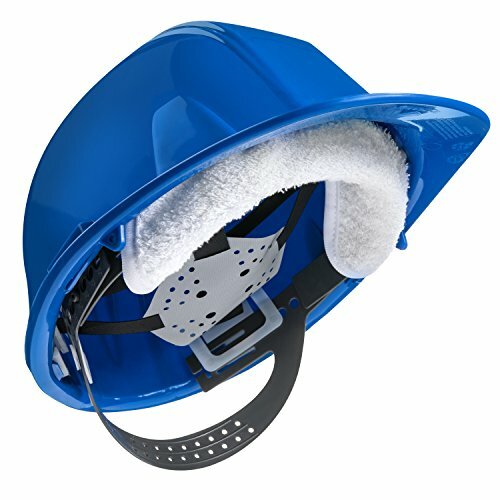 BEST PRICE AND QUALITY - Comfortable 3 sweatbands attach easily to hard hat suspension (fits in suspensions 1.2 to 1.7 inches thick). Keeps sweat away from forehead while conducting work in hot places. Breathable cotton material. THREE sweatbands included for daily changeouts as needed. Hard hat not included. Easily attaches to hard hat suspension with velcro strips. Easier to attach than other products that attach with snaps. Towel material is 100% white cotton and soft, can be machine washed for re-use. See instructions on how to use to reduce fraying. If you have any questions about this product by Paulex Solutions, contact us by completing and submitting the form below. If you are looking for a specif part number, please include it with your message.